This feast is loaded with the most popular items we have to offer! Keeping the lobsters in the provided cooler, fill the appropriately-sized pot (see below) with enough water to cover the lobsters and cooler. Place the water-filled pot atop the stove and bring to a strong boil. Adding salt to accelerate boiling is not recommended: it may result in an over-boiled lobster. Firmly grasp the lobsters behind their arms and carefully plunge them head-first into the boiling water. Some people prefer to cut off the rubber bands, making the case that the rubber affects the taste, but this is optional. If you decide to remove them, be careful, those claws can hurt! Cover the pot with a lid. You may hear a whistling sound as the air begins to escape from the shells. Be mindful of splashing water and any over-boil. When the water returns to a full boil, set a timer for the appropriate cooking time (see below). Continue cooking uncovered and reduce heat as necessary to maintain a soft boil. While the lobster cooks, prepare lemon/butter sauce. Simply melt butter over very low heat and, if you'd like, add lemon sliced in quarters. 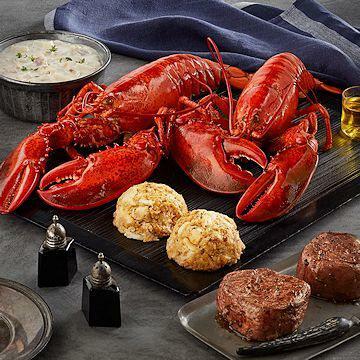 Make sure you try some lobster without any butter or lemon first, though! As your cooking timer expires, your lobsters should be deep red to pink in color. Be sure to wear rubber kitchen gloves or appropriate protection when handling to prevent burns. Carefully remove your lobsters from the pot with tongs or other utensils, and place them on a plate. Let them sit for a few minutes so that the juices can soak into the meat. Rub the uncooked steaks with olive oil, a fresh-cut garlic clove, and sprinkle with salt and pepper. Get the fire of your choice started, letting it burn until it reaches high heat. Place your steaks on the grill. If one is being cooked well done, wait a minute or two before placing the others on the grill so that they will all be ready to serve at the same time. Let the steaks cook on one side for about 2 minutes. Then use your tongs to turn them over. This helps sear in the juices of the meat to make them juicier and more flavorful. Cook steaks according to the chart below. Using a meat thermometer, remove your steaks when they reach 5-10 degrees below the recommended temperature in the chart. Place them on a serving dish and cover loosely with foil for 5-10 minutes. Their temperature will actually continue to rise while resting, and their flavorful juices will lock themselves inside, right where you want them. On your stovetop, place the unopened soup pouch in boiling water. Heat for up to 10 minutes, until soup is hot and bubbling inside. Remove the pouch, but be careful, the content will be very hot. Secure the pouch in a bowl, holding it by its corners or seams, and then snip the corner off to pour soup into the serving dish. To Pan-fry or Saut�: Pan-fry in a non-stick pan over medium heat in vegetable oil or butter for approximately 5 minutes per side. (3 oz. (85g)) calories 210, calories from fat 138, total fat 15g, saturated fat 6g, trans fat 0g, cholesterol 54mg, sodium 42mg, total carbohydrate 0g, dietary fiber 0g, sugars 0g, protein 17g, vitamin a 0%, vitamin c 0%, calcium 1%, iron 2%. (230g): calories 230, calories from fat 120, total fat 13g, saturated fat 9g, trans fat 0g, cholesterol 70mg, sodium 820mg, total carbohydrate 13g, dietary fiber 1g, sugars 3g, protein 11g, vitamin a 8%, vitamin c 6%, calcium 10%, iron 8%. Ingredients: half & half (milk, cream), sea clams (sea clams and sea clam juice, salt, sodium tripolyphosphate, clam flavor (dried soy sauce [soybeans, salt], clam extract, maltodextrin, partially hydrogenated soybean oil), dextrose, disodium inosinate and disodium guanylate, and calcium disodium EDTA. ), water, potato (potatoes, sodium acid pyrophosphate), onion, butter (cream, salt), clam base (cooked clams in natural juices, salt, natural flavoring, butter (pasteurized cream, salt), dehydrated potatoes, dextrose, onion powder, maltodextrin, disodium inosinate and disodium guanylate. ), flour (wheat flour enriched (niacin, reduced iron, thiamine mononitrate, riboflavin, folic acid) malted barley flour), modified food starch, spices. Contains: Milk, shellfish (clams), soy and wheat. (4 oz.) calories 240, calories from fat 140, total fat 16g, saturated fat 3.2g, trans fat 0g, cholesterol 140mg, sodium 811mg, total carbohydrate 8g, dietary fiber 0g, sugars 0g, protein 16g, vitamin a 4%, vitamin c 2%, calcium 11%, iron 8%. Ingredients: Blue Crabmeat, Mayonnaise (Soy oil, egg yolk, vinegar, high fructose corn syrup, salt, spice), Pasteurized Whole Eggs, Cracker Crumbs (Enriched wheat four (contains niacin, reduced iron, thiamin mononitrate (vitamin B1), riboflavin (vitamin B2, folic acid), vegetable shortening (partially hydrogenated soybean oil) salt, baking soda, malted barley flour, calcium carbonate, yeast), Seafood Seasoning Blend (salt, spices, dehydrated vegetables (garlic, onion, parsley & paprika), Olive Oil, Worcestershire Sauce (distilled vinegar, molasses, corn syrup, water, salt, caramel color, garlic powder, sugar, spices, anchovies, tamarind, natural flavor), Sodium Benzoate and Potassium Sorbate Added as a Preservative, Lemon Juice Concentrate. Contains: Crustacean Shellfish (crab), egg, fish (anchovies), milk, wheat.